ELSE SA has announced the funding of a $3 million seed round — this successful capital raise was enabled by a group of investors that include Airbus Ventures, a Geneva-based Independent Assets Manager and Multi-Family Office, as well as numerous additional Swiss- and internationally-based private investors — the seed round follows $3 million previously raised by the company via public support. ELSE SA was founded in 2014 by the team that developed the successful SwissCube, a single-unit cubesat, which was Switzerland’s first satellite. 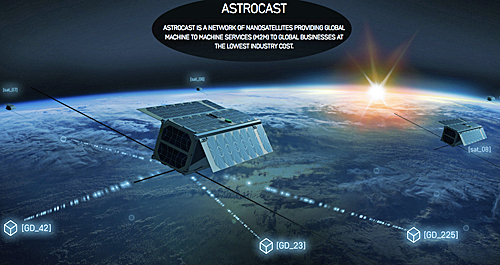 The company is currently developing a network of Low Earth Orbit (LEO) smallsats named Astrocast that will provide cost effective IoT and machine-to-machine (M2M) services to global enterprises. The seed round will support ELSE’s complete business operations through the company’s planned demonstration mission expected in mid-2018, which will launch the first two nanosatellites into LEO. The Astrocast mission is also supported by Swiss grants and by the European Space Agency (ESA) through the agency’s Advanced Research in Telecommunications Systems (ARTES) program, which transforms research and development investment into successful commercial products. Astrocast is designed to provide unlimited coverage all over the planet, with no geographical limitations. The constellation will comprise a total of 64 nanosatellites, with ELSE projecting all to be in orbit by 2021. The satellites will collect data, which will be delivered to ground stations, then distributed for access by customers through a secure Internet gateway. Astrocast is expected to drive efficiencies and operational cost advantages across numerous sectors including retail, agriculture, automotive, transportation and logistics, utilities, maritime, oil and gas, among many others. According to Fabien Jordan, Co-Founder, CEO and Chairman of ELSE SA, the company is extremely pleased to partner with this group of investors during this critical development phase of Astrocast. This seed round validates the firm's ambitious plan to connect the planet and enhance machine-to-machine communications through this innovative satellite constellation and network technology. ELSE SA is looking to disrupt and serve numerous industries and this successful capital raise is an important milestone for the company in that plan. The machine-to-machine sector is burgeoning with new utilizations and benefits identified constantly. While the company has a clear idea of numerous applications and industries that Astrocast will serve, the firm learns of more all the time, further solidifying the company's resolve in delivering this constellation. ELSE SA will now transition into funding its Series A round, which is expected to close in 2018, with Jordan noting the company already has commitments and great interest in the firm's Series A round and fully expect that to be a success. Visit ELSE online at for additional information about Astrocast.